Boeing is progressing with the expansion of the U.S Defense Department's highest capacity communications satellite constellation, recently shipping its sixth Wideband Global SATCOM (WGS) satellite, pictured here in the company's El Segundo facility, for a scheduled launch from Cape Canaveral, Fla., later this year. EL SEGUNDO, Calif., May 17, 2013 -- Boeing [NYSE: BA] is progressing with the expansion of the U.S Defense Department's highest capacity communications satellite constellation, recently shipping its sixth Wideband Global SATCOM (WGS) satellite, pictured here in the company's El Segundo facility, for a scheduled launch from Cape Canaveral, Fla., later this year. Through a cooperative agreement with the U.S. Air Force on WGS-6, the Australian Defence Force will have global access to the WGS on-orbit constellation. 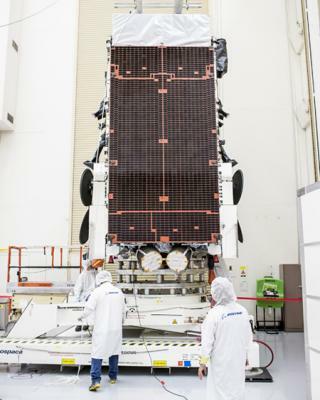 This is the second WGS satellite Boeing has delivered for launch this year. WGS-5 is ready to launch on May 22. WGS-6 will undergo tests, fueling and integration in Titusville, Fla., before being launched. Once in service, the satellite will expand bandwidth capacity, coverage and flexibility for American and allied military forces.